Two / Double storey over-garage extension - architectural design drawings, planning permission submission, structural engineering calculations / steel reports. they rarely used this room. Extension design drawings were submitted for planning permission and with minor modifications in consultation with the planners, the extension designs were approved. 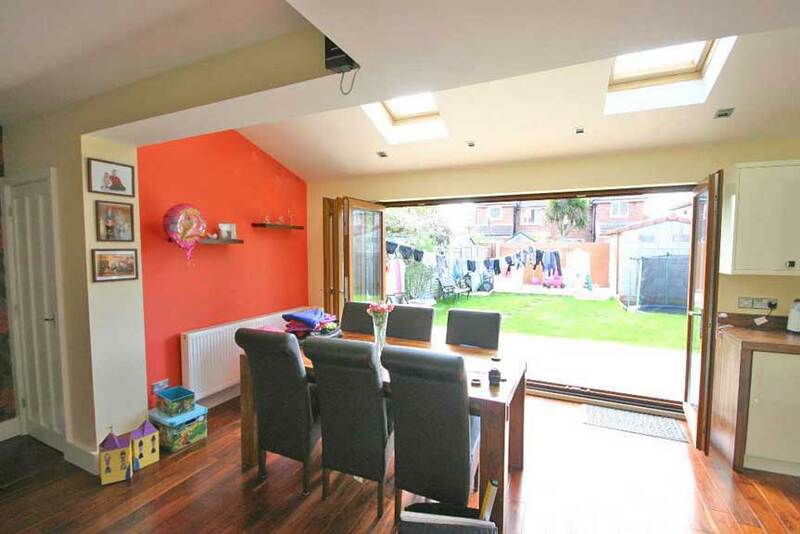 The floor space occupied by the former double-garage and sitting room has been divided in half to result in a spacious sitting room with large window to the front, and a double garage served by a single door. Over the sitting room, a large master bedroom has been created. The construction of the sitting room can be seen here, prior to the opening being created in the wall to the left. Once the room is water-tight and with French doors fitted opening onto the rear garden, the 'knock-through' creates the access from the main house. As with all extension design drawings, careful consideration is given to the position of doors and windows. 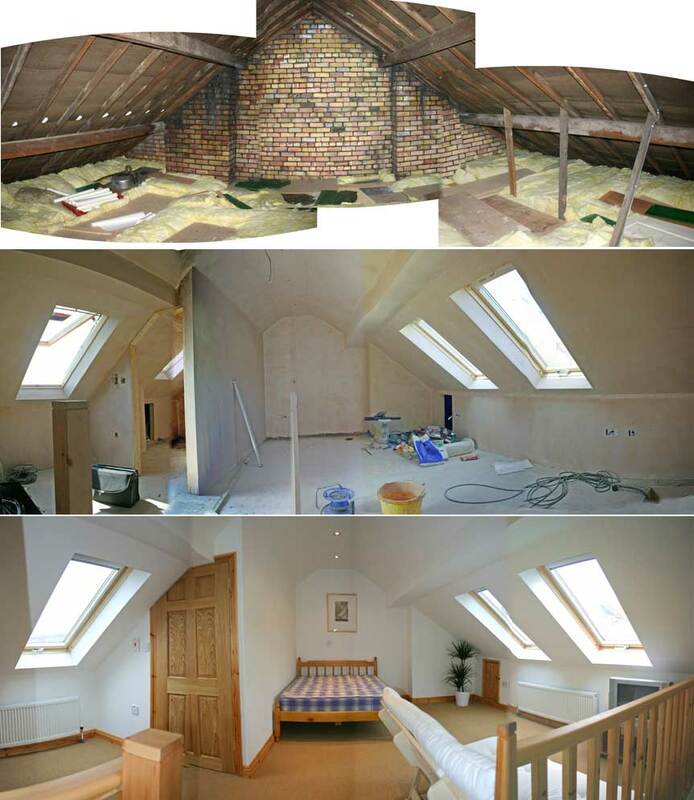 The photo on the left shows the bedroom at first floor nearing completion, with roof timbers exposed prior to fixing of electrics, insulation and plasterboard. 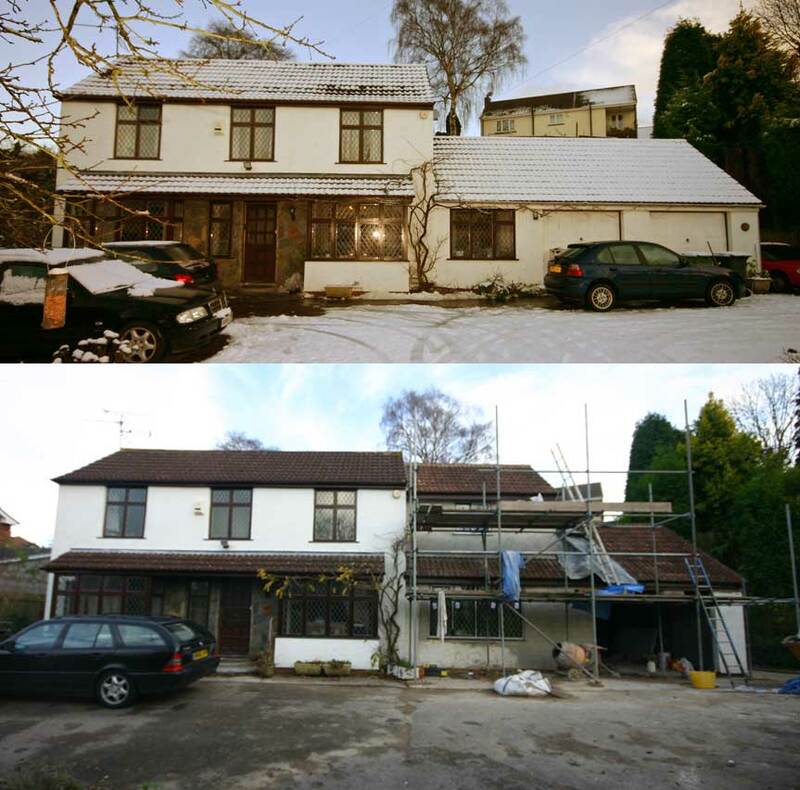 The access from the first floor landing can be seen in the right-hand photo... this demonstrates how accurate extension design drawings have to be... the door is perfectly positioned... critical, since the roof slopes down reducing the headroom. The sloping roof has resulted in an attractive feature of the room, with a small window for additional light and ventilation.... the home-owners love the end result ! Single storey rear extension - architectural design drawings, planning permission submission, structural engineering calculations / steel reports. Single storey rear extension - architectural design drawings, planning permission submission, structural engineering calculations/steel reports. Loft conversion - architectural design drawings including structural engineer calculations / steel reports. This loft conversion in a typical mid-terrace Victorian house has resulted in a large loft room, with Velux roof windows to the front and rear, with enough space for a sitting room / chill-out area, study or dressing area and well sized ensuite... perfect as a family master bedroom, a perfect bedroom for a teenager or student room. Building Plans & Architectural Design services covering the Bristol, Clevedon, Portishead, Westbury on Trym, Iron Acton, Chipping Sodbury, Avonmouth, Shirehampton, Henbury, Harry Stoke, Gordano, Sea Mills, Redland, Soundwell, Clifton, Hanham, Warmley, Ashton, Bedminster, Knowle, Brislington, Bitton, Whitchurch, Fishponds, Horfield, Patchway, Filton, Stoke Gifford, Little Stoke, Stoke Lodge, Cam, Charfield, Dursley, Wotton-under-Edge, Yate, Emersons Green, Downend, Frenchay, Mangotsfield, Staple Hill, Pucklechurch, St George, Montpellier, Thornbury & Alveston, Almondsbury, Winterbourne, Frampton Cotterell, Coalpit Heath, Bradley Stoke, South Gloucestershire, Avon, Somerset, South Wales and the South West regions. 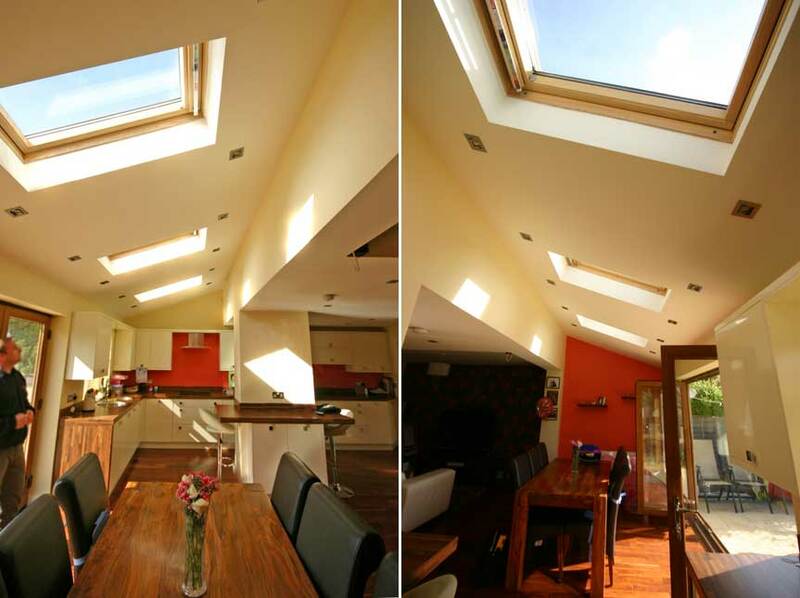 Find out how we can help you with home extensions, loft conversions, internal alterations, new builds, conversions, building plans, planning permission applications or building regulation applications. For all aspects of architectural services contact Thomas Building Plans.Ltd.